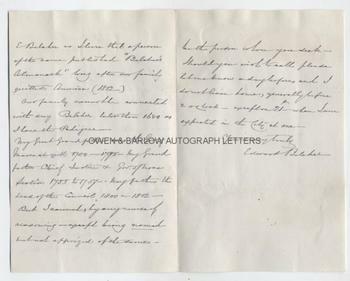 ADMIRAL SIR EDWARD BELCHER Autograph Letter Signed. British explorer and naval officer. Leader of the Arctic expedition in search of Sir John Franklin. ALS. 3pp. 13 Dorset Street. April 15th 1875. To "Dear Sir". "Your note puzzles me greatly. I do not know of any such transaction as that to which you allude. Then the name of Llewellyn Griffiths has an interest in my mind - but I think he had only a daughter. I know of few Edward Belchers but myself (of Nova Scotia). Sir H.B. Head the Canadian Governor was my very intimate friend 1819-20, and Mr Rumsey of London I knew well. Writing will not help you out of the difficulty but perhaps a conversation might elicit some clue to an E. Belcher as I learn that a person of the name published 'Belcher's Almanack' long after our family quitted America (1812). Our family cannot be connected with any Belcher later than 1680 as I have the pedigree. My Great Grandfather was the Govr. of Massachusetts 1704 - 1785, my Grandfather chief justice and Gov. of Nova Scotia 1733 - 1757, my father the Head of the Council 1800 - 1812. But I cannot by any course of reasoning, except being named but not apprised of the same, be the person whom you seek. Should you wish to call please let me know a day before and I do not leave home generally before 2 o'clock - except on 21st, when I am expected in the City at one." 8vo. Approx 7 x 4.5 inches. Some mounting traces adhering to verso, else near fine. Sir Edward Belcher was born in Halifax, Nova Scotia, the son of the politician and Justice of the Peace, Andrew Belcher and great-grandson of Jonathan Belcher, Governor of Nova Scotia. He joined the navy in 1812 and with Frederick Beechey was engaged in the survey of the Pacific and Bering Strait. During this time he took a prominent part in British naval action during the Opium War fought between Britain and China. 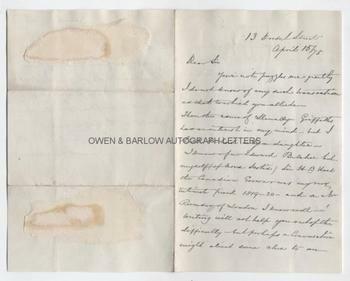 In 1841, Edward Belcher made the first survey of Hong Kong harbour and went on to conduct important survey and exploration work in the East Indies, Borneo and the Philippines. In 1852 Edward Belcher led the Admiralty expedition in search of the lost Arctic explorer, Sir John Franklin. 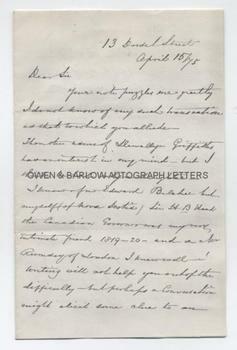 Autograph letters of Edward Belcher are uncommon. Provenance: From a 19th century album compiled by the Blyth family. This family appears to have been connected with the engineer, Benjamin Blyth and the three times premier of Australia, Arthur Blyth.